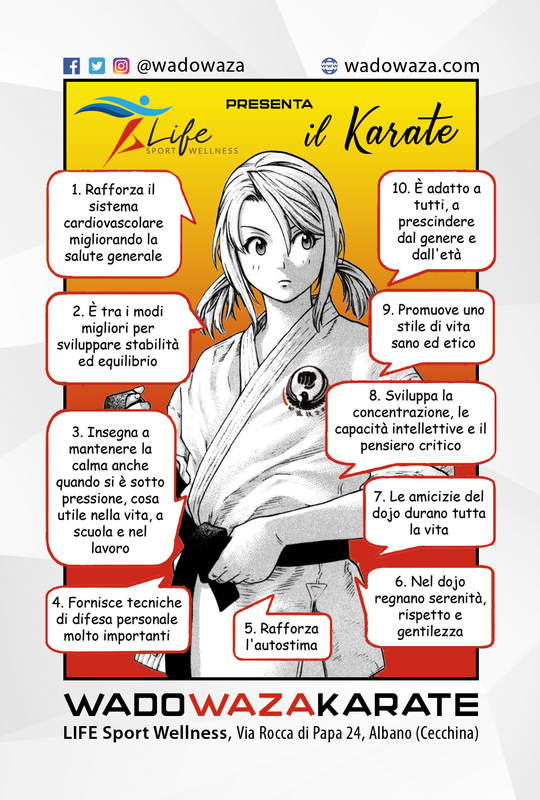 Wado Waza Karate embraces all the Articles of the Universal Declaration of Human Rights and the Budo Charter. Our practitioners must respect the rights, dignity and value of all, regardless of gender, age, ability, ethnicity, nationality, social and economic status, religious beliefs, sexual orientation and gender identity. 1 一 PUNCTUALITY. Punctuality is a must. Lessons always start on the spot, so we must be in the dojo some minutes before, just to be changed and be ready in time. Whenever we would be late (and the lesson already started) we must wait for the master’s permission to enter the tatami mat and join the lesson. 2 二 PERSONAL CARE. We have to wear the karategi in the right way, keeping it clean, fresh and not too much creased. We also have to wear our belt carefully, making a clear knot and balanced tails. We must have a painstaking care of our personal hygiene, always keeping short hands’ and feet’s nails in order to not hurt anyone. For the same reason is not allowed wearing earrings, piercings, necklaces, anklets, bracelets and wrist watches. 4 四 RESPECT. A dojo is a place of deep respect. On the tatami mat, students address every instructor with the appellative of Sensei or Master and every instructor’s assistant with the appellative of Senpai. Anytime we enter or leave the tatami mat we have to perform the salutation, bowing towards the Kamiza (the side of the dojo where you can find the founder’s picture and/or the style’s logo images). Both at the beginning and at the end of each Karate lesson, just after the warming-up session, we perform the traditional salutation ceremony: let’s keep a focused and meditative attitude during this precious moments. When you are going to perform a Karate technique with a partner always bow towards him or her before starting and always bow right after the ending of the performance. 5 五 SILENCE. Mobile phones must be kept off or silenced for the whole training time (unless you have a valid and especial reason for keeping it on). During the training session, we should avoid any talking or chatting in order not to break that mood of concentration needed for a good practice. A budoka is always attentive, polite and focused on what he or she is actually doing, no matter what’s happening all around. 6 六 RESPONSIBILITY. We always have to remember that higher ranked karatekas own the responsibility of being an example for the lower ranked ones. We must keep us conscious and available, respecting the seniors and accepting their advice. Let’s help lower ranked or less experienced people with diligence, humility and kindness. Black belts have even more responsibilities and they must be a role model for all (not only during the training sessions but ever). 7 七 LEARNING. The task of the master is to teach, the task of the student is to learn. We have to listen carefully to the recommendations of our instructor and commit ourselves, both mentally and physically, to put them into practice. We must be scrupulous, persevering and determined. Keeping an open mind and being friendly respectful is essential in order to progress on the path of Budo. 8 八 ART. Traditional Karate is a martial art, and it should be studied and respected with devotion, exactly like an art. If we consider it as a mere physical exercise or a personal defence system or just as a combat sport we won’t understand its intimate and deepest essence, and any real progress, for us, will be foreclosed. 9 九 LEAVING. At the end of the lesson, we have to neatly and silently leave the dojo, meditating on the lesson just ended. We must maintain the same behavior even in the locker room, talking to a moderate tone of voice and using a respectful and appropriate language. 10 十 OUTSIDE. We cannot be good in the dojo without being good outside of the dojo. Let the spirit of Budo feed us every moment of our day, wherever we are. Let us always remember that the techniques we learn in the dojo are dangerous: not all the people deserve to know or are able to manage them, so it is better avoiding to show them around unless expressly authorized by the master. Budō, the Japanese martial ways, have their origins in the age-old martial spirit of Japan. Through centuries of historical and social change, these forms of traditional culture evolved from combat techniques (jutsu) into ways of self-development (dō). Seeking the perfect unity of mind and technique, budō has been refined and cultivated into ways of physical training and spiritual development. The study of budō encourages courteous behaviour, advances technical proficiency, strengthens the body, and perfects the mind. Modern Japanese have inherited traditional values through budō which continue to play a significant role in the formation of the Japanese personality, serving as sources of boundless energy and rejuvenation. As such, budō has attracted strong interest internationally, and is studied around the world. However, a recent trend towards infatuation just with technical ability compounded by an excessive concern with winning is a severe threat to the essence of budō. To prevent any possible misrepresentation, practitioners of budō must continually engage in self-examination and endeavour to perfect and preserve this traditional culture. It is with this hope that we, the member organisations of the Japanese Budō Association, established The Budō Charter in order to uphold the fundamental principles of budō. Objective. Through physical and mental training in the Japanese martial ways, budō exponents seek to build their character, enhance their sense of judgement, and become disciplined individuals capable of making contributions to society at large. Training. When training in budō, practitioners must always act with respect and courtesy, adhere to the prescribed fundamentals of the art, and resist the temptation to pursue mere technical skill rather than strive towards the perfect unity of mind, body and technique. Competition. Whether competing in a match or doing set forms (kata), exponents must externalise the spirit underlying budō. They must do their best at all times, winning with modesty, accepting defeat gracefully, and constantly exhibiting self-control. Dojo. The dōjō is a special place for training the mind and body. In the dōjō, budō practitioners must maintain discipline, and show proper courtesies and respect. The dōjō should be a quiet, clean, safe, and solemn environment. Teaching. Teachers of budō should always encourage others to also strive to better themselves and diligently train their minds and bodies, while continuing to further their understanding of the technical principles of budō. Teachers should not allow focus to be put on winning or losing in competition, or on technical ability alone. Above all, teachers have a responsibility to set an example as role models. Promoting. Persons promoting budō must maintain an open-minded and international perspective as they uphold traditional values. They should make efforts to contribute to research and teaching, and do their utmost to advance budō in every way.